Sorry, but there are currently no Automated External Defibrillator (AED) courses in the diary. Please contact us for more information. 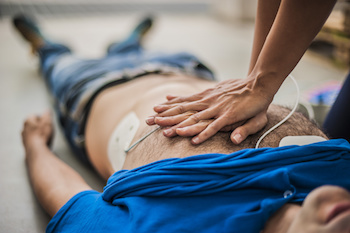 Course Covers: Electrical Defibrillation is well established as the effective therapy for cardiac arrest, the most important determinant of survival being the time from collapse to delivery of the first shock. Today the widespread deployment of Automated External Defibrillators (AED's) is considered a realistic strategy for reducing mortality due to heart disease. Persons using an AED should recieve regular training - it is recommended by the resuscitaiton council that this should be at least yearly and preferably more often. Suitable For: Persons with an automated external defibrillator at the workplace. Requirements: There are no pre-requisites to attend this course. Qualification Gained: Certificate of attendance vaild for one year.